Thank you, Morgan, for sharing Mason’s birth story with us! I’ve had a lot of time to think about this post. Still, it’s difficult to put into words the whole experience of the day Mason was born and really capture my feeling of it. But I’ll do my best. Tuesday, November 22nd 2011 started out the same way that all of my other Tuesdays had in the recent past. It was a cool, cloudy day. Your dad took your brothers to school and headed off to work. I stayed home and thought about what else I could possibly accomplish before your arrival. The house was clean, the kitchen was stocked, the birthing pool was ready. I felt really good that morning. It was 1 day past your due date, and I had stopped guessing as to when you would decide it was time. I had let go. That afternoon, I met your dad for lunch, something that we often do on Tuesdays since he typically has a lighter schedule. We talked about what our future looked like to us. Your dad even mentioned that he would like to build a small cabin somewhere, maybe by a lake, to use as a vacation home. He also called the hotel where he had reservations out of town for the Thanksgiving holiday and cancelled. We had agreed that if you had not arrived by Monday, he and your brothers would have to stay at home. Looking back, that lunch was a nice way for us to connect as a couple one last time before you came. And while we were there, I noticed the beginnings (yet again) of some contractions. Not painful. Just tightening, like so many other times before this day. Could this be it? Maybe. Maybe not. We’ll see, I thought. After lunch, I decided to run some errands. Trader Joe’s for some flowers and a few more snacks to stack in the pantry. Dry cleaning. The bank. Frozen yogurt bar for a last-minute craving. 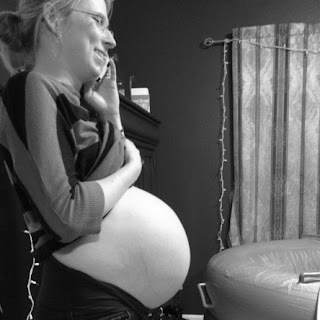 The contractions continued, though far apart, somewhat erratic, and still non-painful. But they were persistent. I started to think this was really our day, but I didn’t want to get overly-excited as I had a couple of weeks prior when your dad and I had even gone so far as to begin filling the birthing pool. I had a routine appointment scheduled with Juliet, our midwife, at 4:00 that afternoon. By then, my contractions were bouncing back and forth between 8 and 12 minutes apart and they were beginning to intensify a bit. When I got to Juliet’s, I said, “I think I’m going into labor–fingers crossed!” We were all anxious for you to come before Thanksgiving! Juliet was equally as excited as I was, and we decided that she should check me to see if I had dilated at all. I was 2 1/2 to 3cm by that point, and after a discussion, we decided to go ahead and jumpstart the process with a cervical sweep and stretch, which took me to 4cm instantaneously. Afterward, we sat and chatted a bit about our Thanksgiving traditions with our families–who makes the turkey, etc etc. Finally, I remember Juliet telling me that I’d better get going in case things started to accelerate. I gathered my things, gave her a hug, and headed out the door. The contractions at this point were definitely strong, and so I knew that you were really ready this time. This was it. You would be in my arms within the next 24 hours. I called your dad, who was on his way to pick up your brothers. I texted our birth team to let them know to be ready. I called my mom and told her. And as I pulled into a gas station to fuel up one last time–just in case we needed to head to the hospital or anything–I called Jessica for the thousandth time that day. We chatted. I had to stop and breathe through some of these contractions by now. And they felt closer together, though I hadn’t been tracking them since I had been in the car. Jessica, however, had glanced at the clock each time. She said to me, “Morgan, these are like 3 minutes apart.” So I headed home, and as I pulled in, your dad was getting your brothers out of the truck and into the house. I told him that we needed to start filling the tub and boiling water. He helped me with that and got together some dinner for your brothers. At one point, I bent down and told Camden, “Our baby is going to come out today. Are you ready?” Your brothers could feel the excitement and were happy to join in. By this time, I was having to stop, lean over a chair or table or bed, and sway my way through each contraction. In between, I was making phone calls for everyone to come when they could–no big deal. Just start moseying this way when you can. It was 5:30pm. Your dad came into the bedroom while I was continuing to prepare everything and said, “Wait, we need to get a picture of your pregnant belly one last time” as he snapped a shot with his phone. This was an important and overwhelming experience for me and my family. So many words come to mind to describe it: empowering, humbling, unexpected, beautiful, fast, emotional, raw. I could go on. Was it the experience that I sought out? Yes and no. It was not what I had envisioned. I didn’t anticipate that my labor would be an hour and a half long (or short, rather–not complaining, by the way). I had spent so much time preparing for more of a marathon. I planned on having the time to soak in the experience. I planned on having a moment where I felt like I couldn’t do it anymore and having to push past that. In reality, I didn’t have the time to process it as it was happening. I simply let my body have the control and went with it. Having said that, it was pure and uninhibited. It was beautiful and life-changing for me. Was it also painful? Of course. Would I do it again? Absolutely. YES! After experiencing both a medicated hospital birth and a natural home water birth, the latter is where it’s at, people. Not everyone’s bag, I know, but I would never choose a medicated birth again. And for inquiring minds, we are both healthy and happy. No medical facility required. I slept in my own bed that night, with my husband and new baby. Camden even woke up early the next morning and crawled in with us. For me, that’s the way to welcome a baby into the world–surrounded by family. I have a newfound respect for the birthing process. Because it is just that–a process. It’s not merely an event in a woman’s life. It’s something that can and will shape her as a woman, whether it happens naturally or with medication or with surgery. It becomes a part of who we are and who our babies will grow to be. The way we choose to birth matters. It affects us individually and as a society. So if you’re planning to have a baby–now or much later–just take the time to consider your options under your particular circumstances. Own the experience. I’m so proud that I did. Here is the slideshow of Mason’s birth, thanks to Jes Deis, our wonderful photographer. Thank you also to Nicole Aldridge, our doula, Juliet Dietsch, our midwife, and Maya, her apprentice. You all were tremendous!